About 7 miles west of Brady on US 87, north of the highway at a "T" intersection of 2 gravel roads there is sign on the highway pointing to the West Sweden cemetery. Three miles west of this point - is the turnoff for West Sweden. The gravel road goes south another 3 miles where you cross on a small bridge over Brady Creek and up around a 90° right turn (west). Before you make the corner to should be able to make out the old railroad bed. Within a ¼ mile drive, you are in the middle of "downtown" Whiteland. 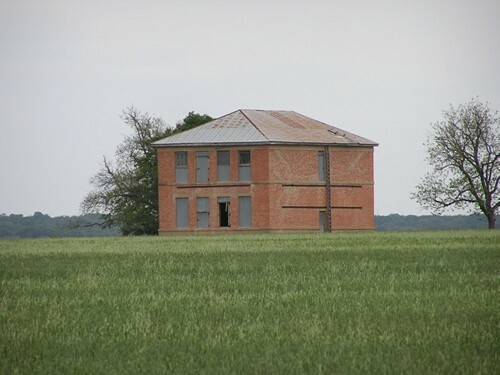 The school building is in a field to south. The cotton gin and the loading pens were in the pasture to the north of the county road. Whiteland was named to honor the White family who donated land for the townsite. A post office open the following year and by 1914 the town reported a population of fifty. The prosperity of the 20s boosted the population to 125 by the middle of that decade, but the Great Depression took its toll and by 1943 only 40 people were enumerated. The post closed sometime before the mid-1950s. 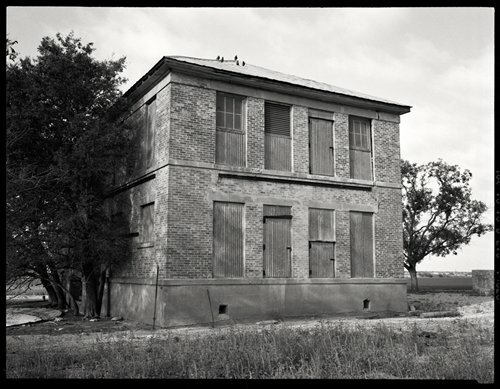 "Whiteland is another Texas ghost town to have just about blown away with usually present winds. It is / was located in McCulloch County, about half way between Brady and Melvin. When the railroad continued on westward from Brady, the line branched at Whiteland ( also listed on the railroad map as Homer Junction ). The earliest line, the Frisco, was built through on it way from Brady to Menard in 1910. In 1911, the Gulf, Colorado and Santa Fe was extended to Melvin and Eden. The Frisco Railroad came south from Brownwood into Brady in about 1903. When the Santa Fe came from the east, Lometa to San Saba and on, the two lines joined near the East Sweden community and shared trackage from there into Brady and on west to Whiteland ( Homer Junction ).